I love speaking at Career Day(s). It gives me a chance to meet a new group of kids (boys AND girls, which is different for me), hear from other adults with cool jobs, and introduce kids to entrepreneurship. 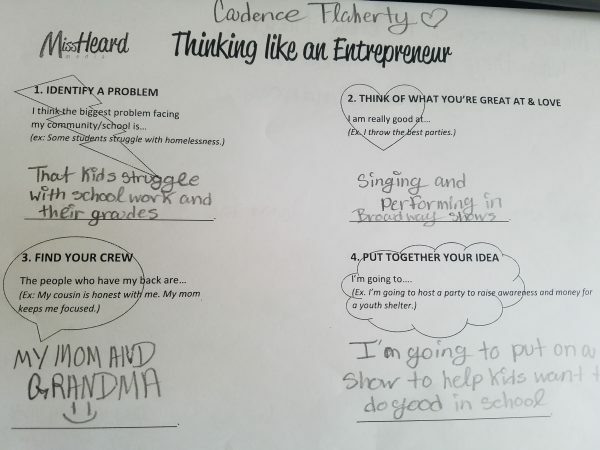 Part of my entrepreneurship talk includes getting students to think about their passions and skills, because those pairings could lead to an amazing business or non-profit! This year, I upped the challenge by asking them to solve a real life entrepreneur problem: how do you get people to hear your message, attend your event, and support your product/event? 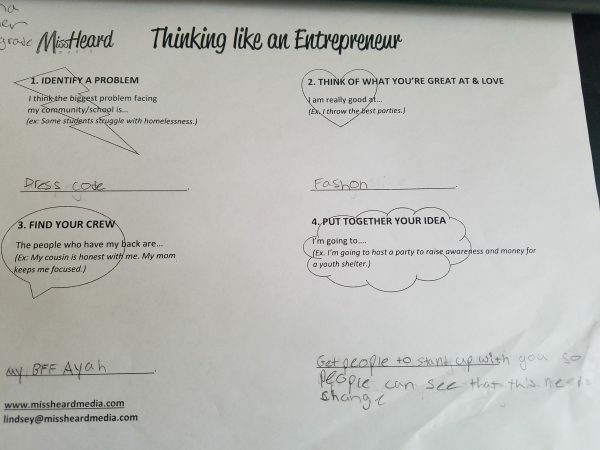 I invite kids to share their entrepreneur worksheets with me to post online. Normally I get a handful. This year, I got SO MANY kids who wanted to share! There are too many to share photos of each, so I am instead showing photos of a few of my favorites, and typing up the rest. Students are asked to: Identify a problem their school is facing, think of what they love doing and are good at, identify people in their lives who support them, and put together their idea. Finally, students were asked to think about how to get people to attend/buy/support their final idea. 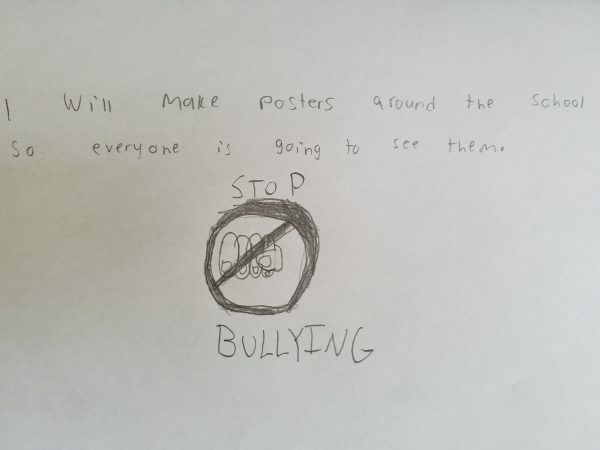 Cadence will make posters to tell students why to come to her performance. Brenda: A problem is stereotypes. I am good at drawing. Astrid, Alexandra, and Amira are my crew. I want to start a club where people can come talk. I will let people know that they are not alone. 6th grade boy: A problem is doing hard math. I do my homework early. My sister and brother support me. I will do chores for money. Genesis: A problem is that people cry about not having a phone. I am good at drawing. My family and friends support me. I will make posters about a party! Edwin: A problem is that people are homeless. I am good at science. My mom loves me and my dad is determined. I am going to make a lemonade stand to raise money for a homeless shelter. 6th grader: A problem is bullying. I am good at soccer. My friends support me. I am going to teach self-defense. I will get someone famous to come! Trishae: A problem is dress code. I am good at picking out good clothes. My mom and best friend support me. I will be a fashion designer. Viviana: A problem is dress code. I am good at art and engineering. My friends support me. I will protest the dress code with art and robots! I will get people to join me by offering a prize, or protesting during an event where people will be. Keyra: A problem is rumors and losing friends. I am good at piano, drawing, listening, and drawing cool pictures (ed note: it’s true, there’s an awesome robot!). My brother and awesome friend Carla support me. I will have an inspirational talk. I will get people to come by talking to them respectfully, posting on social media, or going on strike. Jace: A problem is that people are homeless. I am great at basketball. My parents support me. I will shoot 3 pointers and donate $15 to a homeless shelter each time one goes in. Jonas: A problem is people being worried about grades and stress. I am good at reading manga. My dad supports me. For each manga I read, teachers will help students study. I will start this by doing a giveaway. 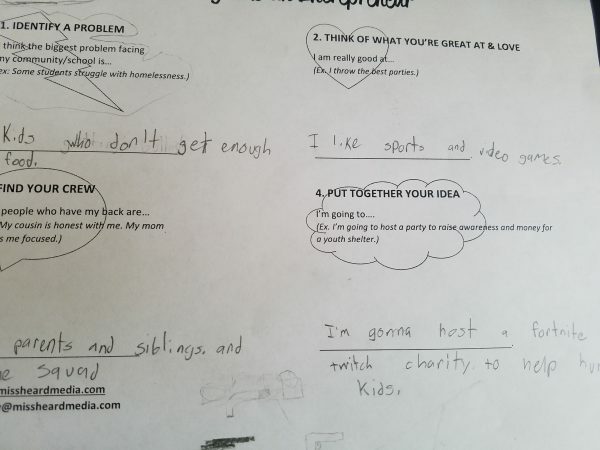 Student: A problem is bullying. I am good at paying attention. My friends support me. I will start a march. I will get a famous person to come. Ariana: A problem is rumors. I am good at talking, cooking, and writing. My BFF, Mom, and Nana support me. I will make a paper. Danny: A problem is that students are being bullied. I am good at fishing. My mom, dad, and sister support me. For every fish I catch, I will sell for $11 and give it to the school to help stop bullying. I will tell people on social media. Student: A problem is bullying. I am good at singing. My brother is really nice. I will host an all-girl sports game for gender equality. I will make flyers and tell people about the problem. Student: A problem is dress code and rumors. I am good at making people happy and eating! My crew is Alexandra, Brenda, Amira, Arianna, and Ben. I will help people with body image. I will do this by making videos to tell people know they’re not alone. Joseph will advertise his Twitch stream on social media.